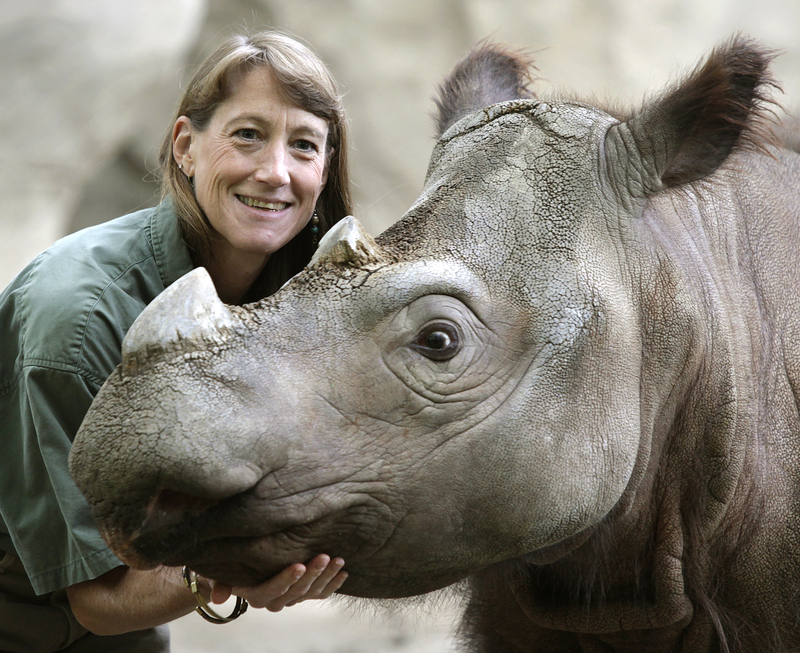 CINCINNATI (March 31, 2014) – “Suci”, one of the world’s rare endangered Sumatran rhinos, passed away late on Sunday, March 30. Surrounded by the keepers and veterinary staff who cared for her daily, she died at her home at the Cincinnati Zoo & Botanical Garden. The female Sumatran rhino, born at the Cincinnati Zoo in 2004, was one of three Sumatran rhino calves born to mother, “Emi” and father, “Ipuh.” Suci’s keepers first became concerned about her when they noticed her losing weight several months ago. After careful research and hours of dedicated monitoring, staff began treating her for hemochromatosis, otherwise known as iron storage disease. Although hemochromatosis is extremely difficult to diagnose in a Sumatran rhino, Suci’s mother died from the disease in 2009. In humans it is a heritable disease and many of Suci’s symptoms were similar to those of her mother’s. A necropsy will be performed on Suci early Monday, but it will be several weeks before the zoo will have the final results. Terri Roth with Suci in 2009. Photo by Michael E. Keating. For several months, scientists, keepers, and veterinarians at the Cincinnati Zoo have been treating Suci for the complex disease, while hoping for a complete recovery. Therapeutic phlebotomies, the treatment used on humans and in African black rhinos, were performed by Zoo staff and the early results were promising. The three Sumatran rhino calves born at the Cincinnati Zoo were the direct result of years of breakthrough research by scientists at CREW. The Cincinnati Zoo was the first place to successfully breed this critically endangered species in zoos in over 112 years. To date, only one other calf has been born outside of Cincinnati, at the Sumatran Rhino Sanctuary in Indonesia, where Indonesian veterinarians employed the breeding protocol developed by CREW scientists. That calf, named “Andatu” was sired by the first calf produced at the Cincinnati Zoo “Andalas.” The Los Angeles Zoo sent Andalas to Sumatra in 2007 to help bolster the Indonesian program. Now, the only Sumatran rhino living in North America is Suci’s brother “Harapan” who also resides at the Cincinnati Zoo. Harapan moved to the White Oak Conservation Center in Yulee, Florida in 2008, and later moved to the Los Angeles Zoo, before returning to Cincinnati in July of 2013. “The Cincinnati Zoo has been committed to saving the Sumatran rhino for 25 years, and we plan to keep working to ensure this species will still be around a century from today,” said Thane Maynard, Executive Director of the Cincinnati Zoo. Considered the most endangered of all rhino species and perhaps the most endangered large mammal on earth, it is estimated that no more than 100 animals exist, almost all on the island of Sumatra in Indonesia. The primary cause of the species’ decline is the loss of forests due to oil palm, logging and human encroachment, even in some national parks, and poaching for its horn, which some Asian cultures believe contains medicinal properties. Today, there are only nine Sumatran rhinos living in zoos worldwide. The Cincinnati Zoo works closely with the Indonesian Ministry of Forestry, the Indonesian Rhino Foundation, the IUCN Asian Rhino Specialist Group and the International Rhino Foundation, to protect this species in the wild, and also propagate Sumatran rhinos in zoos. Both approaches will be necessary to secure the future of this critically endangered species for future generations.